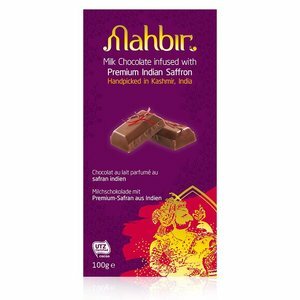 From the land of spices, for the first time Mahbir brings you India’s most treasured spice – Premium Indian Saffron. Lovingly handpicked and harvested by the co-operative farmers in Kashmir, India, each strand of our saffron bestows an invitation into a culinary terrain which has yet to be explored. 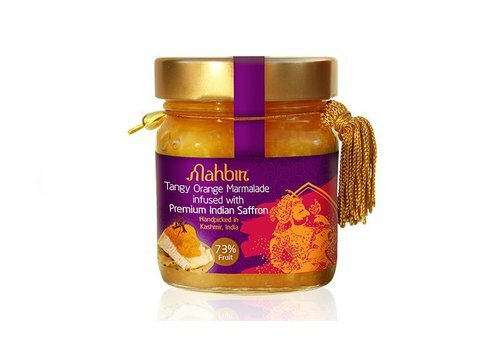 Be inspired to try new recipes with saffron and to make an occasion of the everyday with those who matter most. Use sparingly but embrace wholeheartedly. Go forth, and season a dish with your very own creativity. 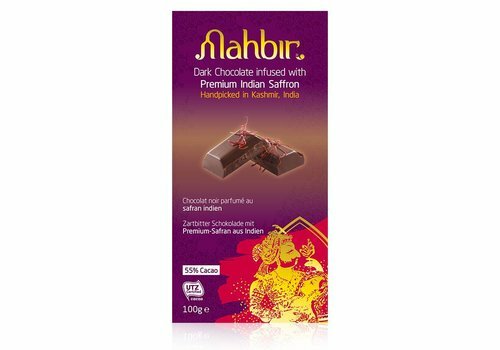 After two years of recipe development, we’re really excited to introduce a unique selection of saffron-infused treats that you will love and recognise, yet have a completely new flavour. 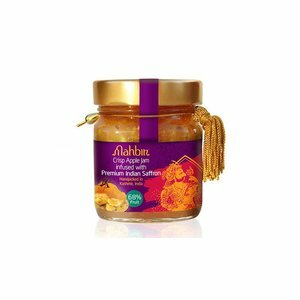 Whether it’s a guilty pleasure for yourself, or you’re wanting to serve family and friends that extra special something, our delicious range of saffron-infused food products is guaranteed to be the talk of the party. Our saffron-infused food range is handmade using only the finest natural ingredients and like our saffron, contains no artificial colouring, flavouring or preservatives. 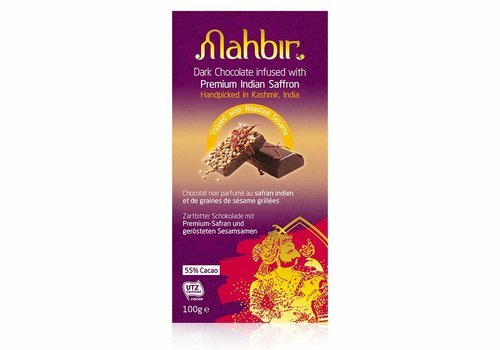 This bar of artisanal dark chocolate has been delicately infused with 100% red stigma-tip saffron strands, handpicked in Kashmir, India. 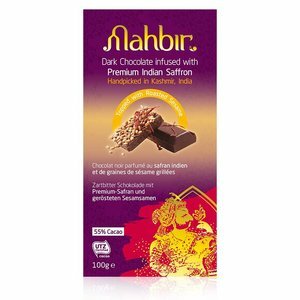 Luxurious in both taste and appearance, topped with roasted sesame seeds. 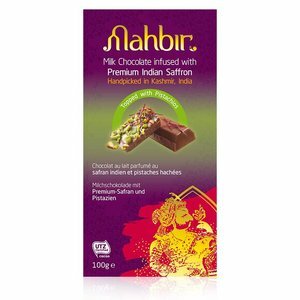 Milk chocolate infused with 100 % pure , award-winning Indian saffron and topped with chopped pistachios. Luxurious in both taste and appearance. 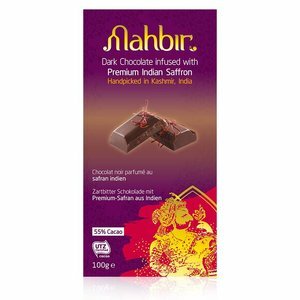 Artisanal Dark Chocolate infused with Premium Indian Saffron handpicked in Kashmir, India. 100 % pure red stigma-tip saffron strands, handpicked in Kashmir, India. 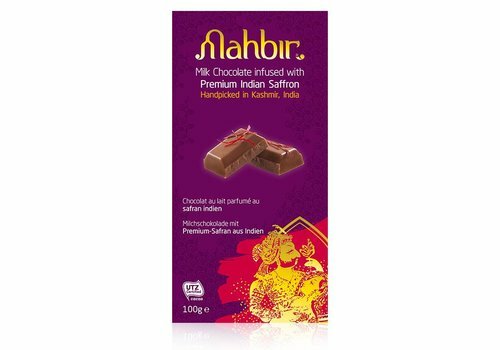 Creamy milk chocolate infused with premium Indian Saffron. Handpicked in Kashmir, India.